Hubs and I are going out to dinner to celebrate a five-year anniversary. Not ours–we’ve been married mumble-mumble years now. A different anniversary. In the fall of 2008, I was diagnosed with breast cancer. I had the whole treatment shebang — surgery, chemo, radiation. And now, a daily pill to suppress the hormones that fed my particular brand of the Big C.
This past week, I had my five-year mammogram and…all is clear! I wish fireworks could shoot off or confetti thrown…or something! At the end of each treatment step, there were little celebrations. The nurses in the chemo room had a funny wind-up doll they would make dance on your last day of chemo. The technicians in the radiation department had a bell that patients rang when they got zapped for the last time. Everyone in the waiting room would look up, smile and applaud. Those celebrations, silly as they seem, had great meaning. They were the outward manifestation of the huge internal sigh of relief as you stepped away from that part of the cancer journey. The five-year all-clear is another big benchmark. Most cancer statistics measure those who make it past “year five.” It places you in the “survivor” category. So, instead of dancing dolls and ringing bells, we’ll go out to dinner. And that’s fine with me. The good news on the mammogram came to me through electronic medical records, and I must say, I LOVE them. Instead of having to wait days until your doctor calls with the results, and then possibly playing phone tag if you’re not available when the call comes in, signing up for electronic records means…when they know the results, I know the results. Mammogram in the a.m., and in the p.m., a note in my email box to check the electronic records website for test results. There it was, from the breast health center: “benign finding.” I have to smile at their evolution in communication techniques. Last year’s results were “negative.” Now, I know that “negative” in this test is good news. But I wonder if that word scared some folks into thinking it meant something bad–negative–and so they changed their wording. A few days later, I got another email alert to go to the website, and there was a message from my doctor’s office saying “good news” with the same test results. She’d just had a chance to look at them, I guess. Which made me grateful again for the electronic records process–I hadn’t had to wait for her read on the results to get the news myself. For many cancer patients, waiting for test results is incredibly stressful. Speaking of the ACS, here’s a tip for women facing cancer treatment of any kind. The ACS has a program called Tender Loving Care that sells, at extremely reasonable prices, wigs, head coverings and other items for cancer patients, especially breast cancer patients. Their site is at this link. 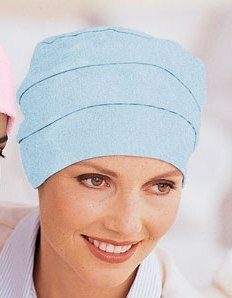 I bought a wig and several head coverings from them, including this sweet powder-blue hat that kept my head warm at night. My sister-in-law was able to share it and other of my head gear with a friend of hers undergoing treatment for cancer, and it turns out to be her friend’s favorite, as it was mine. I am glad the little blue hat found a good home, and I hope when she’s finished with it and ready to ring her bells and see her dancing dolls, she’ll give it to another woman walking the cancer journey.